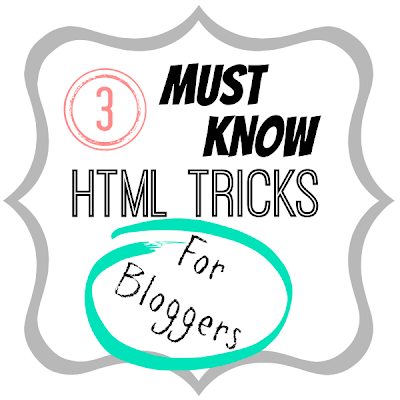 Rootandblossom: Three HTML Tricks a Blogger Can't Go Without! Three HTML Tricks a Blogger Can't Go Without! I am sloooowly learning some HTML. I remember the first time I ventured into HTML it took me nearly 4 hours (possible exaggeration because I don't quite remember) to build a navigation bar. I'm still excessively short of being a pro but there are a few tricks I do use routinely. Maybe you already know this, and to that I say, AWESOME! And also ask that you teach me some more! Yes, I do know there is a super handy button on the top of the page that centers items for me but sometimes it doesn't work- I know, crazy that not everything runs smoothly and seamlessly behind the blogging scene. I run into this mainly when I'm try to align the Mom Lovin Hop with inlinkz, for some reason that HTML cannot be manipulated with the auto middle alignment button. At first I was totally turned upside down over this, "WHAT AM I SUPPOSED TO DO WHEN THE ALIGNING BUTTON DOES NOT WORK?" But after I stopped stressing out (1st world blogger problems…) I did a little research and a little experimenting. By placing <center> at the beginning of the HTML I want centered and </center> at the end of the HTML I want centered I can center what I'm targeting. Easy-peasy! The <center> notes the beginning of the center alignment and the </center> ends the center aligning. Who has ever added a period to a widget title because Blogger wouldn't let you close the window until the title field was closed? Come on, don't be shy to own up to this, I have plenty of times! There is a way to get rid of this through manipulating HTML in the main blog template but because I'm not super confident with big HTML stuff I'm staying clear away from that for now and sticking to the little things. To be able to add a widget without having a visible title simply add <!-- --> to the title box. Go ahead and try it right now- it's like magic! This is my absolute favorite. When I'm visiting blogs I like to leave a comment with a link back to my blog- I don't know about you but I'm always curious to see what my readers are up to so I like to make my blog accessible to others. I used to just paste a long HTML but I quickly felt that was a little tacky. Now when I sign my comments I put <a href="http://www.rootandblossom.com">XO/Lena @ Root&Blossom</a> . This one is a little more tricky, let me break it down for you. Go ahead and click it to see what I mean. And there you have it, these are my three can't live without HTML codes. Do you have any that you use on a regular basis? What are some of your HTML tricks? The last trick is so cool! I'm going to start doing that!! Thank you!!! I've been so frustrated by being unable to leave a widget title blank and have tried other tutorials that haven't worked...this one worked perfectly!! Thanks! The hyperlink signature is pretty cool too. I really do need to sit down and learn some HTML!! I've felt intimidated/overwhelmed by it and have just been getting by with the very minimum...I know it would open up so much more for me...just need to find a time to do it!! This is WONDERFUL. Thanks especially for #2 and #3! 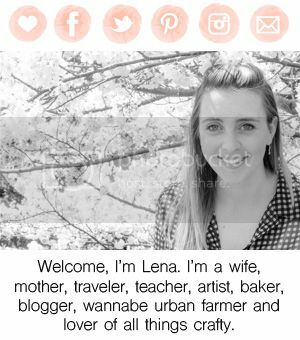 Great ideas Lena and I love the little changes you've made to your blog design! I've noticed #3 in your comments and have wanted to try it. Thanks for the tutorial! Sometimes all the more intricate tutorials are too much for me at this time. Heck, I just figured out what html was 3 months ago! These are awesome! I didn't know the second and third tips, thanks! Also, I like the changes you've made to your blog! It looks great! Thanks for this! I have been wondering if there was a better way to leave my url info than just typing it out and it looking cheesy. LOVE that you put it into practice so soon! :) Yea it's awesome. I didn't know that! Wonderful! Yea it seems super random but works like a charm. NO problem! Hope it makes your blogging experience a little more enjoyable and user friendly! Thanks Whitney! You know how it is, always have something you want different. :) Someday I might actually stick to something. Yea I know I need things short and sweet, hence the style of this post. Thanks Chelsea, its fun to keep progressing the blog. No time like the present! :) Thanks for stopping by Tiffany and thanks for the sweet words about my blog!